John Grimm’s grave is located on Cardington Road just east of East River Road on the right side. There is a a grave that stands out in Marion County by virtue of its unusual location—the edge of Cardington Road! Every Sunday from February 1960 to February 1961, a local lawyer by the name of Charlton Myers broadcast a fifteen-minute segment on WMRN. The subject matter was generally local history, and the transcripts of those broadcasts were eventually collected in a work called Tales from the Sage of Salt Rock. In the book Mr. Myers provided some of the back story about the grave in the road. 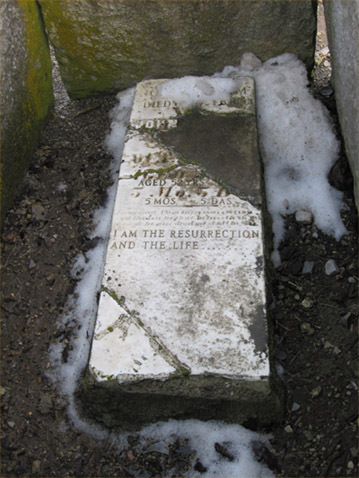 Mr. Myers wrote that the grave is the final resting place of a man named John Grimm. Apparently Grimm was struck by a falling tree at that exact spot in 1833. For reasons unknown, that is where his wife decided that he should be buried. The grave is easy to spot while driving along Cardington Road—it’s surrounded by four upright concrete slabs that surround the original (and now nearly illegible) gravestone. To read about other weird bits of Marion miscelanea, check out the “Odd and Ends” chapter of Haunted Marion, Ohio. This is the scareist thing ever. I grew up on East River Road not too far from this grave. A buddy’s dad used to always tell us that the man that was buried there was still alive and if you went there anytime after 8 PM, he would come out from the ground and talk with you before randomly killing you. Of course, that story is completely made up, but it scared me senseless when I was a child, and that story has made me never forget about the grave on Cardington Road.